Beneath the elegant curve of its coupe-like silhouette, the restyled and updated 2016 Audi A7 mixes the ride of a luxury sedan, the latest technology, handling for all-weather grand touring, exquisite interior craftsmanship, and debonair styling lines. The A7 is based on the A6 sedan, but the A7 sportback has its own distinct look that combines modern grace with a retro sports-car feel. That look has been updated for this model year with a front end that has a more aggressive feel thanks to thinner, more angular LED headlights and a reworked single-frame grille. The rear also gets a facelift in the angular direction with reshaped taillights that stretch in a more horizontal direction and rectangular exhaust outlets. There are two engine choices for the A7: a 3.0-liter V6 TDI clean diesel or a 3.0-liter supercharged V6 TFSI gasoline engine. The TFSI has been tweaked to now deliver 333 hp, which is a 23-hp increase from last year’s model, while still delivering 325 lb-ft of torque and still getting 20 mpg city/30 highway/24 combined. The diesel engine (240 hp) doesn’t have as much power as the gasoline engine, but it does crank out a massive 428 lb-ft of torque to move you quickly from any stop, and it gets 25/38/30 to save you some money at the gas station. Both engines are paired with Audi’s quattro all-wheel drive and a ZF-sourced 8-speed automatic transmission. While the diesel engine is more muscular off the line, the supercharged gas V6 is more responsive once it gets moving. No matter which engine you choose, the A7 will deliver a memorable driving experience. It accelerates and handles corners like a smaller, sportier car, and it rides smoothly and quietly, even on rough surfaces, like a luxury sedan. The interior updates for the A7 are more understated, and that matches the clean, business-like feel of the cabin. The Multi Media Interface has been improved with a new Nvidia Tegra 30 processor, which delivers double the processing power of its predecessor, allowing the LCD screen to display Google Earth data as well as satellite traffic updates, real-time weather and news, local gas station prices, and more. Other technology updates include high-speed LTE connectivity that can support up to 8 devices, a new touch input for the MMI system, upgraded Heads-Up Display components, an optional Bang & Olufsen sound system, and improvements to the night vision and pre-sense safety systems. There are also new material choices for the interior (Valcona leather and Beaufort walnut wood trim) and a new selection of colors for the upholstery. The A7’s front seats can adjust to fit practically any body size or shape and offer great support for even the longest trips. They even have an option for full ventilation and 5-mode massage capability. The rear bucket seats have been pushed further back to increase legroom, and there are scallops in the rear headliner to create more headroom, but even with those kind considerations, taller passengers may be a bit uncomfortable in the rear seats. The A7 hasn’t been tested by the National Highway Traffic Safety Administration or the Insurance Institute for Highway Safety (these cars are just too expensive, and there are too few of them for crash testing), but it does come with a lengthy list of safety features. There’s the full array of airbags, antilock brakes, stability control, a rear-view camera, and Bluetooth hands-free capability. Optional safety features include blind-spot monitoring, night vision, corner-view, adaptive cruise control (upgraded this year with full stop-and-go functionality), active lane-keeping assist, and the pre-sense system, which sounds an alert if a collision is imminent. 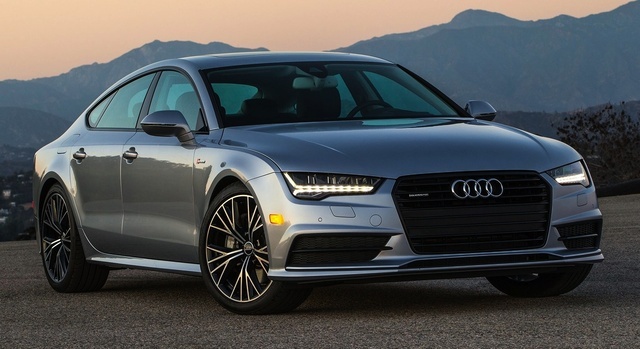 What's your take on the 2016 Audi A7? GuruZCPP5 Nice looking car. Sits a bit lower than I would prefer. Headroom in back seat limited. PhilNOKC My wife's car. The TDI was definitely the perfect engine for her. She still gets unsolicited compliments from all her friends and acquaintances. The car grabs the spotlight wherever she goes. It makes a great cross country mobile. Plenty of room for luggage. True 36 mpg at 75-80 mph. Stunning quality interior materials and technology. Have you driven a 2016 Audi A7?